Mooresville Jewelry and Loan carries an extensive range of firearms for sale in our store at discount prices. We offer Mooresville a wide range of firearms including shotguns, rifles, and handguns from top of the line firearms manufacturers like Browning, Beretta, Bushmaster, Colt, Glock, Marlin, Remington, Rossi, Ruger, Sig Arms, Smith & Wesson, Weatherby, Winchester, and many others. We sell firearms only in accordance with federal, state, and local firearm laws. Firearms purchased in our Mooresville store can be shipped to any licensed FFL dealer within the United States to handle the ownership transfer. 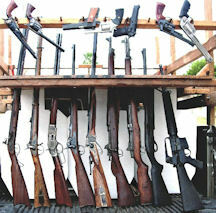 Mooresville Firearms. Just a short drive from Charlotte NC to Mooresville.